Imagine your skin as a juicy plum - moisturized, taut and smooth. However, as we age our skin loses moisture faster and with environmental factors like pollution and the sun, our skin loses elasticity, luster and firmness. While we can't turn back the hands of time, we can restore skin's moisture balance, stimulate healthy collagen levels and reduce the appearance of fine lines and wrinkles - making your skin appear more like a freshly picked plum. 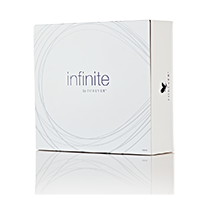 With infinite by Forever™, we've created a new way to experience Aloe. Our experts found peptides, natural minerals, botanicals, desert plants and the latest skin science that not only complement Aloe, but actually increase its efficacy and and benefits. You’ll not only see the difference, you’ll feel it, too. We harnessed two key components of the vitamin-rich fruit, the apple: apple extract and apple amino acids to give this cleanser strong protection against the effects of aging. This mild and moisturizing cleanser will leave your face clean and soft without a dry after-effect. Don’t just wash away dirt and makeup, help your skin look and feel younger to the touch while laying a strong foundation for the rest of your anti-aging routine. Our first ever beauty nutritional supplement to support aging from the inside out. These two small tablets taken daily can support multiple internal body systems as well as your overall health and skin appearance. This unique formula features a proprietary blend of French melon concentrate, phytoceramides and marine collagen to help fight free radicals, reduce the appearance of facial wrinkles and increase skin’s bounce, flexibility and hydration. Two powerful ingredients work together with Aloe Vera in this potent elixir to improve skin elasticity, reduce the look of fine lines and wrinkles, soothe and smooth the skin. This stacked formula is a skin scientists’ dream bolstered with the power of nature and the most advanced laboratory findings to help you look and feel your best. This moisturizing powerhouse contains more than 15 skin conditioning ingredients. Our Aloe is synergystically enhanced with an anti-aging essential oil blend. Together, these ingredients of the restoring creme deliver proven results for soothing skin and seal in all of the powerful benefits your skin has just received so you can start slowing the sands of time.